Driving where there aren’t roads is never easy. Roadless places are full of sharp rocks, loose surfaces, couches, and screaming people. Happily, one guy watching Eskimos move huge piles of meat figured out a solution to all these issues, and it’s nice and bonkers-looking as a bonus. They’re called Rolligons. In 1935, William Hamilton Albee, then teacher living in a small Eskimo village in the Bering Strait can observe his friends Eskimos hoisting a boat loaded of 4 tons of meat on the shore with several bottles [bags?— ED] of sealskin sewn and swollen under the boat. They shoot to the top of the slope without difficulty despite the gravel and stones. In 1951, William Albee, now in Carmel, California, begins a modern adaptation of Eskimos bags. It develops nylon impregnated rubber ‘bags’, very flexible, can be deformed but not extensible. After many consultations, it is ultimately the Goodyear Tire and Rubber Company, which agreed to manufacture them on plans designed by Albee. These large rubberized cylindrical bags, based on the large sealskin bags, are called “Rolligons” by Albee, and prove remarkably adept at getting motor vehicles over rough terrain. The things are almost comically able to get over jagged spears of stone that you’d surely think would destroy them. The incredibly low pressures in the bag is what makes them able to both avoid punctures and damage so well, and why they don’t crush you when you get run over by a Rolligon-equipped vehicle. That video is also a fantastic place to hear the word “journaled” used in an engineering context several times. The Army was Albee’s first big client, requiring very rugged-terrain vehicles for use in Korea. This partnership led to Rolligon-equipped Jeeps, REO trucks, and Dodge Power Wagons. 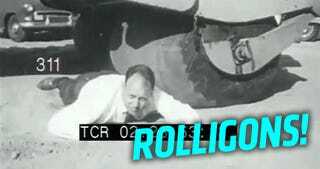 While the Rolligons were certainly a success and versions of it are still in use today, they were expensive to make and not exactly a mass-market item, so by 1960, Albee had to sell the company. I imagine driving a Rolligon-shod vehicle must seem sort of surreal, like piloting a boat flowing over a river of Jell-O or maybe driving a massive mechanical slug. I’d love to give it a try. I’m also pretty sure Albee is the only known head of a motor vehicle or vehicle accessories company to have himself photographed being run over by his own product. On multiple occasions, even. It actually looks like it might feel kind of good. I wonder if there’s a market for Rolligon Massages. Who wants in on the ground floor of this amazing idea? We’ll be rich!